Take advantage of the vast spectrum of feel-good treatments on offer in our massage practice and treat yourself to some pampering with a classic massage or one of our signature Alpenbad massages. Our massage therapists are happy to assist in deciding which massage is the right one for you. From 12.30 pm – 8.00 pm. Morning appointments can be arranged on request. Purchase Print@Home gift vouchers and print them out immediately. Stimulates the metabolism, improves circulation in the organs and activates self-healing powers. Followed by a foot massage. Releases tensions and toxins and stimulates metabolism. Promotes regeneration. Can be used for cosmetic and medical purposes. Relieves tension, releases blockages. Purchase a block of 5 treatments for 112 Euros and you receive one treatment free of charge. Classic full-body massage. Relaxes the muscles, improves circulation. Pay 4 – get 5! A circulation-boosting, full-body treatment with specially selected local oils. A soothing heat wrap for the back, warms the muscles. Following a period of quiet relaxation, you feel fit and full of vitality. Specially selected local oils have a relaxing, rejuvenating effect. This full-body treatment eases tension in the muscles and joints. The combination of special heat wrap and massage results in a feeling of calmness and relaxation. 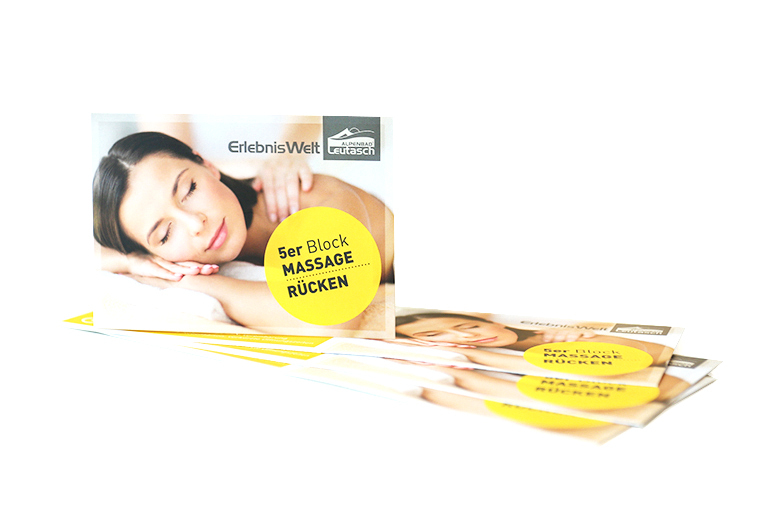 Your body is treated with stones and oils from the Wetterstein and Karwendel mountain ranges. The combination of massage and warm stones has a relaxing and, at the same time, energising effect. This massage eases tension in the muscles of the neck and shoulder area. The effect of the massage is enhanced by the use of St. John’s wort oil from the Tyrolean mountains. This gentle spinal massage releases emotional and physical blockages. It stimulates the flow of energy resulting in a feeling of calmness and relaxation. St. John’s wort oil strengthens the intervertebral discs and has a soothing effect on the nerves. The application of hot and cold stones has a stimulating effect on the metabolism and eases muscle tension. Warm stones were already used for therapeutic purposes by the indigenous peoples of Asia and America. The treatment creates a feeling of well-being and relaxation. The use of ear candles for the treatment of numerous complaints stretches back to the indigenous peoples of America and Indonesia. The treatment offers relief through the effects of warmth and pressure equalisation creating a state of well-being which enables you to experience deep relaxation and harmonisation. Relieves symptoms of anxiety and stress. This body wrap prevents the storage of fat in the fat cells and the skin is tightened and lifted through a network of collagen and elastin. Extracts of yam root and soya protect against premature skin aging and balance the skin’s moisture levels. A patented combination of active plant ingredients reduces the thickness of the subcutaneous layer of fat and smoothes the surface of the skin. The result is a reduction in the circumference of problem areas and minimisation of persistent cellulite. Natural active ingredients from the birch tree, horsetail plant, nettle, ivy and caffeine flush out metabolic waste products. While the wrap takes full effect, a facial lymphatic drainage treatment cleanses and detoxifies.